If I had to think up a pithy title for this book, I think I’d call it “Angela’s Ashes: The Documentary”. It’s all here: the feckless father, the bedraggled and burdened mother, the dead babies, the supercilious priests and nuns, the sheep’s head stew and the overflowing toilet. And the power of this book is that it’s here again, and again, and again, and again. In his lengthy introductory chapters, the author comments that the sainted-mother-who-held-the-family-together is a stereotype, and yet when you encounter her so often, it is insensitive to dismiss her as just a sentimental trope. I find the claim that this is the first such account surprising- perhaps I have been too influenced by the recent genre of memoirs that he criticizes for their “blinding nostalgia”, although I think that they tend to be more afflicted by the Monty Python “Four Yorkshiremen” syndrome. And why Dublin, I wondered? Surely there were tenements in many 19th century urban centres that lingered right up until the second half of the 20th century? 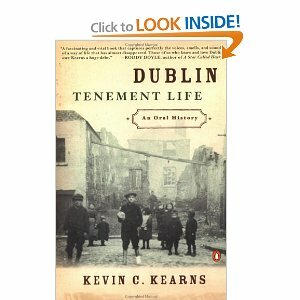 His opening chapter ‘History and Evolution of the Tenement Slum Problem’ explains that the tenement process was particularly accelerated in Dublin after the 1801 Act of Union emptied Dublin of the Anglo-Irish gentry who had built their spacious Georgian houses terraces and squares close to be close to the centre of Irish government and the Irish Parliament. The second chapter ‘Social Life in the Tenement Communities’ is a good summary of the recurrent themes that emerged from the oral histories: so good, in fact, that the oral testimony itself began to seem rather repetitive and redundant. Still, it is the oral narrative that is important here and the way that the respondents framed their story. In this regard, Kearns was largely silent about methodology, except to thank particular individuals in a short Acknowledgments page. The book is probably aimed at a more general readership, but I would have appreciated an appendix giving more information about how participants were recruited, when the interviews were conducted, and the prompt questions used, if any. The oral testimonies are repetitive but repetition itself underscores the commonality of shared experiences. Kearns has managed to triangulate his themes by recruiting a range of voices- shopkeepers, chemists, charity workers, school teachers- as well as the tenement dwellers themselves. Again, an appendix summarizing the status and situation of the informants would be helpful, as this information is enclosed in a brief italicized paragraph preceding each narrative and not easily searchable. There are good photographs which I discovered just at the point when I thought I might jump onto Google image to find some- again, there is no list of illustrations to alert you that they have been provided. In his chapters preceding the oral testimony, Kearns summarizes the evidence and teases out the main themes but does not interrogate them particularly stringently. I would have liked to have seen a more critical discussion of the role of the church and religion, and an exploration of the apparent paradox of professions of happiness alongside such poverty. In an Australian context, David Potts broached such topics in his book The Myth of the Great Depression, sparking quite a controversy in so doing, but also providing a meatier book than this one. Suffice to say that I read the summary chapters with interest, read several testimonies until I realized that they were all saying much the same thing, picked my way through the rest on the basis of the italicized biographical paragraph at the start of each one, then read the four longer narratives with which the book closes. I’m not really sure what qualities qualified these closing narratives for special treatment beyond their length. The book cried out for a conclusion of some kind as it just seemed to trail away at the end. So- my assessment? Interesting initial chapters; good for dipping into; evocative photographs; let down by lack of appendixes and tables; and valuable for providing the testimonies themselves, albeit rather uncritically.